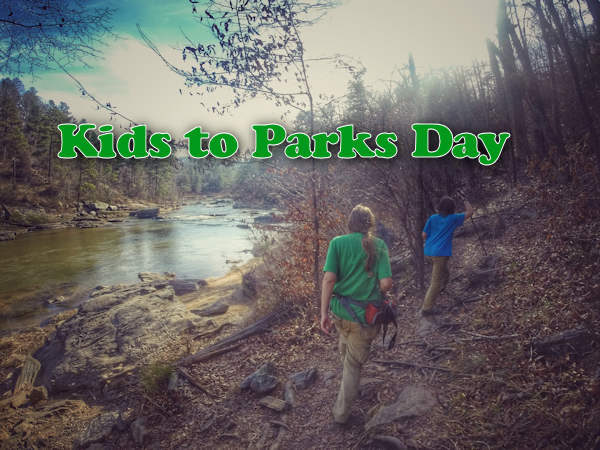 Celebrate Kids to Parks Day this Saturday with Georgia State Parks. Kids to Parks Day is an annual, nation-wide day of outdoor activities that encourage families to discover and explore their local parks. Many Georgia State Parks have organized festivities including crafts, hikes, paddling, and more. National Park Trust offers special Activity Guides & an Adventure Book to take along. Pledge to take kids to the park, and you could win a prize pack. There’s a long list of Kids to Parks fun, on the Georgia State Parks website. Here are some cool events to check out! Paddle Lake Buncombe for sunset & moonrise while searching the night sky for planets, shooting stars, and constellations from a canoe. This event is recommended for children 6+ who are accompanied by an adult. Canoe & PFD are included. Click to learn more. An experienced GSP Ranger walks beginners through the excitement of learning to aim and shoot a bow in a safe setting. Click to learn more. Dress to get wet and search a stream for salamanders and crawdads. Bring a picnic lunch and learn about turtles afterward. Also, bring your phone camera to join in the park’s Eye Spy 20 Camera Scavenger Hunt for a chance to win! Click to learn more. Children are invited to bring fishing gear and bait to a lake stocked with catfish, bass, and bream. Fish caught can be kept up to the limit! For more amazing Kids to Parks Day fun, check out the list of events at Georgia State Parks and choose your own adventure! The Kids to Parks Day website also lists events in local area parks across the nation.